Opened in February 1908, the Palau de la Música Catalana, home of the Orfeó Català, is the only Art Nouveau concert auditorium listed as a World Heritage Site. Built between 1905 and 1908 by the architect Lluís Domènech i Montaner as a base for the Orfeó Català with money raised by popular subscription, the Palau de la Música Catalana is a piece of symbolic and emotional heritage for a whole people who identify with its history. The concert auditorium − one of the world's most distinctive venues − has been for over a hundred years the privileged setting for national and international concerts in the city of Barcelona. 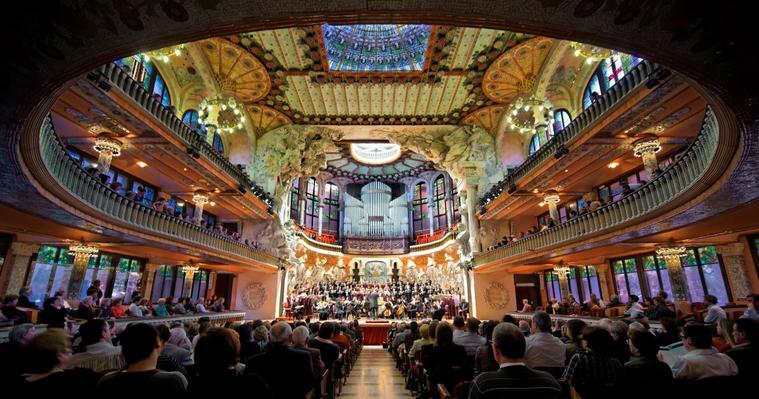 This jewel of Catalan Art Nouveau architecture, the only Art Nouveau concert auditorium to be listed as a World Heritage Site by UNESCO (since 4th December 1997), is today an essential meeting place in the cultural and social life of Catalonia. The Fundació Orfeó Català-Palau de la Música, as the sole manager since 2012, based on values of excellence, participation, social commitment and Catalan identity, backs the activities of the house choir: the Orfeó Català, as well as the Escola Coral and the Cor de Cambra del Palau de la Música Catalana. Today, therefore, still among the most genuine symbols of Catalan culture, the Palau and the Orfeó, as dynamic, open institutions, foster music, choral singing, knowledge and dissemination of the country's heritage and social and cultural cohesion.